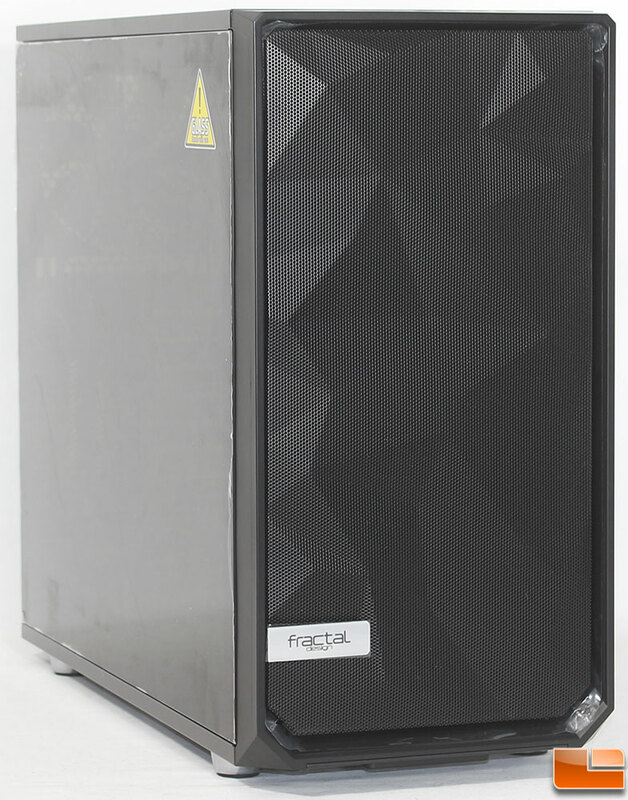 In late 2017, Fractal Design introduced the Meshify C, a mid-tower case with a Tempered glass side panel, and a distinctive front panel. In early 2018, they shrunk the case down to Micro-ATX size with the Meshify C Mini. Then in October 2018, Fractal Design took customization of the Meshify C to a new level, by offering eight new front panels, allowing the end user to easily customize their case. Now, Fractal Design is once again expanding the Meshify line-up to include a full tower model, that will fit up to E-ATX motherboards! The Meshify S2 maintains the same front panel design as the other Meshify cases, which features an angular mesh design. Being a full tower, you expect there to be a wide range of cooling options, the Meshify S2 includes room for up to nine 140mm fans, or for those that want to use liquid cooling there is room for 2 360mm, one 280mm and one 120mm radiators. To control all of these fans, Fractal Design has included the Nexus+ PWM fan hub which controls three PWM and six 3-pin fans. Cooling options aside, that’s not all that the Meshify S2 has to offer. There are no bolts holding the Tempered glass side panel in place, the top exhaust cover removes with the press of a button, while a hidden tab releases the front mesh panel, there is USB 3.1 Gen 2 Type-C support, support for custom liquid cooling systems and more. The Fractal Design Meshify S2 has just been made available with a MSRP ranging from $139.99 to $149.99. Let’s take a quick look at the features and specifications of the Meshify S2 before we take a close look at the Meshify S2. Acknowledging that most people purchase cases online rather than in a retail environment, Fractal Design packages their cases in standard cardboard boxes without the added expense of color. 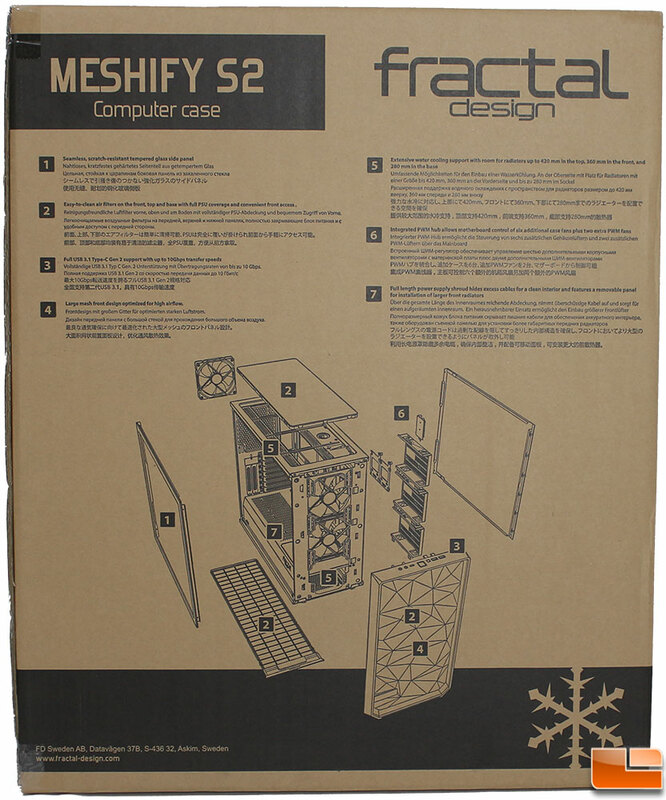 The front of the box provides a simple overview of the case, while the back provides a detailed exploded view of the Meshify S2. On the two sides, there is some additional information such as it’s specifications, and dimensions. In a nicely detailed box, Fractal Design includes all the necessary hardware to have a successful build, and even includes a few extra items to make things a little easier. 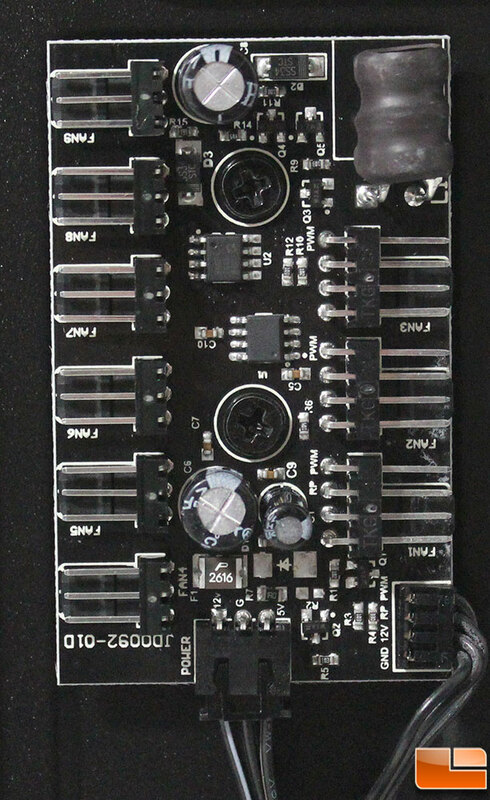 Included in the accessory pack is 13 motherboard/reservoir bracket screws, 20 2.5″ drive screws, 12 3.5″ drive screws, 4 power supply screws, 1 additional motherboard standoff, standoff installation tool, 12 3.5″ drive rubber vibration dampeners, 6 cable ties, and 4 side panel screws. The extra items that they have included is two liquid cooling reservoir brackets, a SATA power extension cable that is nicely wrapped, and a little microfiber cloth to clean the Tempered Glass panel. 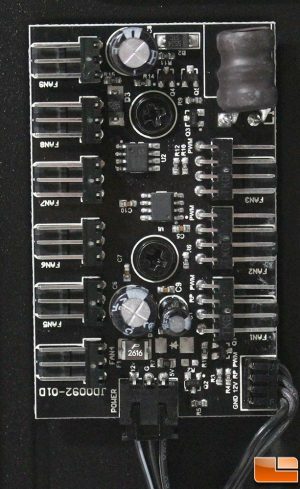 The included user guide is usually tossed aside rather quickly, however I have to say that I was impressed with the level of detail that Fractal Design goes into in the guide. After the usual install guide, they then present several nice graphics to show the various cooling options, such as fan placement and liquid cooling options. Let’s move on to taking a look at the exterior of the case.